Directions and contact information Buenos Aires Bed and Breakfast. Email – buenosairesguesthouse@hotmail.com (or use the form below). Directions / How To Find Us. Buenos Aires Guest House is situated in a quiet residential street, just 1 minute walk from the seafront and the De La Warr Pavilion. The town centre is just around the corner from us where you will find a large variety of shops, cafes and restaurants. Linked to the M25 London with the A21 (sign-posted Sevenoaks and Hastings). Take the A27 and then the A259 to Bexhill from the Brighton / Newhaven area. From the Channel Ports of Dover/Folkestone to Bexhill you can take the coastal route A259. The journey will take approximately 90 minutes. When entering Bexhill please follow the signs (brown in colour) to the seafront and the De La Warr Pavilion. Albany road is adjacent to the car park of the Pavilion. 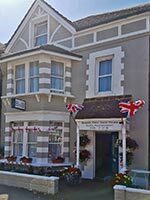 Our guest house is a short 6 minute walk from Bexhill trainstation. When exiting the station turn right towards the seafront. At the corner (Kerry’s winebar) turn right and walk along the seafront. Albany Road is the fifth street on your right. We are the third house on the left. Frequent trains from London Victoria, Charing Cross (via St. Leonards), East Croydon to Bexhill. Direct trains from Ashford International to Bexhill – journey time approx. 55 min. Direct trains from London Gatwick take only 1 hour 20 minutes. Daily National Express coach service from London Victoria station. 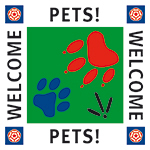 The drop off point in Bexhill is just a few minutes walk from our guest house. Monday to Saturday. So effectively you can park without any restrictions from 4 pm until 10 am. Free unrestricted parking is only a one minute walk. Please ask us when you arrive.